I have seen several adaptations of R. L. Stevenson’s novella, including an amazing British series called Jekyll that follows one of the not-so-good doctor’s progeny in modern times. One of the amazing parts of the story of this book is how it immediately caught the imaginations of the public and was adapted for the stage within a year of its publication. But I realize recently that I had never actually read the slender tome myself. 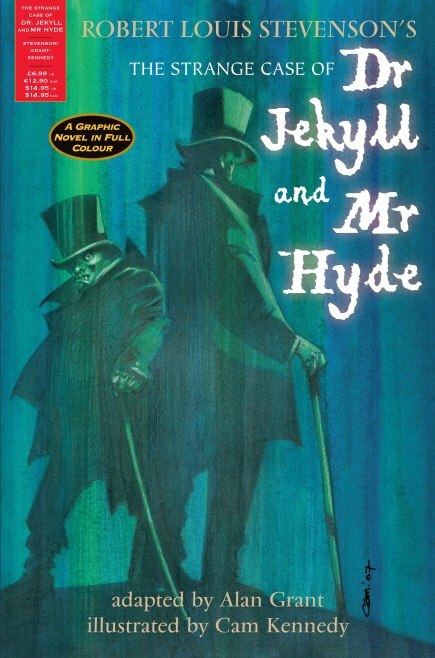 Unfortunately, the big reveal that Henry Jekyll (properly pronounced JEE-kill, I recently learned) and Edward Hyde are one and the same is the one part of the tale that is always consistent across all adaptations, so it is impossible for the story to titillate and surprise in the same way it would have been for readers in the 1880s. The idea of a split-personality has long been linked to this piece of literature, and the names of the title characters are part of our vernacular. BUT, this doesn’t mean the book isn’t worth reading. I really enjoyed Stevenson’s prose, and it is always interesting to return to the source. I surprised to find that in the original that nature of Jekyll’s original “sins” that lead him to want to extricate his two halves from each other are never mentioned, and the details of Hyde’s antics are equally left to the imagination. In order to stretch the story into a full-fledged play or movie the adapters have had to fill in some of these details, which can really alter the tone and nature of Hyde. For instance, in The League of Extraordinary Gentlemen, Hyde reveals to Mina that Jekyll occasionally had ‘impure thoughts’ about boys, and his overwrought Christian guilt made him consider himself a great and terrible sinner when really he was a pretty boring and upright citizen. I found the ambiguity in the story itself very intriguing, and it seems ripe for someone to explore not only the exploits of Hyde during his short life, but Jekyll’s past and his other experiments that are only hinted at in the original. I was also surprised to see that the Hyde of the original story is nothing like the huge monster versions in Van Helsing and League of Extraordinary Gentlemen, but a tiny, young and underdeveloped man who does not have amazing strength, but unbridled passions. This entry was posted on August 5, 2014 by Phoebe Darqueling. It was filed under Books, Graphic Novels and Adaptations, Movies and Television and was tagged with Book Reviews, Books, Dr. Jekyll, Edward Hyde, Henry Jekyll, Mr. Hyde, R. L. Stevenson, Steampunk, The Strange Case of Dr Jekyll and Mr Hyde.